Having the right equipment in place is key – but partnering with a company who has an established and reliable service network to back it up is just as important. Standard can provide timely resolution to technical problems, facilitate system repairs, manage installations, perform preventative maintenance, deliver professional training programs to address staffing needs, and more. We offer a selection of flexible service options to accommodate a wide variety of customer requirements. We’ll work with you to choose the service plan that’s right for your business. Standard can also provide services a la carte as needed, to minimize your downtime and keep your operations on track. If you have a general question about your equipment or need to inquire about service, the best place to start is with Standard’s Technical Service team. Email ts@sdmc.com or call (800) 526-4774, extension 2, and our experts can provide assistance throughout North America. The Technical Support hotline is available Monday through Friday from 9:00 am to 5:00 pm EST. After hours emergency response is available via our answering service. 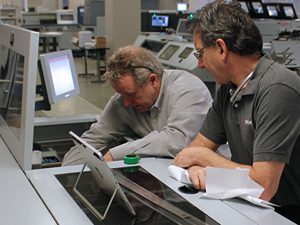 Standard is pleased to offer in-depth technical training classes to customers, dealers, print partners, and third party service providers for nearly every Hunkeler and Horizon feeding and finishing solution. 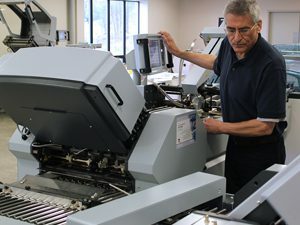 Classes are conducted in our 15,000 square foot state-of-the-art training facility in Andover, MA and administered by our professional team of paper handling and post-press specialists. 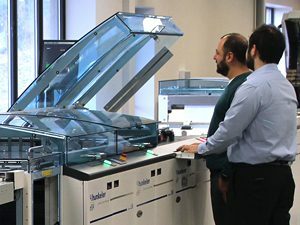 Learn intensive hands-on and troubleshooting skills specific to each product, and become fully-versed in day-to-day machine operation to ensure maximum productivity and up-time. Classes are supported with helpful documentation, including ongoing access to technical handbooks and service and parts manuals. On-site training at your facility is also available. For class schedules and booking, please email traininginfo@sdmc.com. >> View Training Catalog Now! If you need to order parts or supplies, coordinate a return, check order status, or find your local Standard Horizon dealer, Standard’s Customer Service team can help. Our customer service representatives can be reached by email at cs@sdmc.com or by calling (800) 526-4774, extension 1. Most Standard Horizon products are sold and serviced through a trained network of authorized dealers across North America, who pride themselves on providing the highest levels of sales and service support. Hunkeler solutions are available directly from Standard in cooperation with industry-leading continuous-feed digital press partners. Service support for Hunkeler solutions is provided by the digital press partner or directly from Standard if required. Standard Technical Service is on hand to connect you with the appropriate service resource to address your specific issue.